Vintage - John Aynsley and Sons China, the April Rose Pattern #2554 - Scalloped - Manufactured in the 1950's - Total of (19) Pieces. A Charming Tea Set by Aynsley and Sons, in their beautiful "April Rose Pattern #2554, along with the unique Silver Display Stand, and Silver with (6) Black Tip Handled Spoons. This is a Wild Rose Floral in Pink, Violet and Lavender, with Green and Blue/Grey Leaves. The Flowers form a Wreath on the Saucer Lip, and Outside of Cup, with a Single Rose Inside. A (19) Piece set which allows a Service for Six. 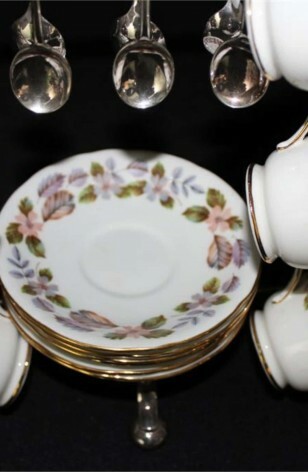 Pieces are Trimmed in 22kt Gold on Rim of Saucer and Cup, along with Cup Handle and Foot. Sit it out on display at all times with Pride of Ownership, but use it as well for that unique setting.